...the whale shark usually grows to 12 metres...some are said to have seen one at 20 metres. Thailand has some of the best dive sites in South East Asia, with Koh Samui and the rest of the archipelago contributing no less than 30 of those. So if you are looking for things to do in Koh Samui, whether you are an advanced diver, novice diver or you've just always wanted to try diving, there are a multitude of dive options, trips and courses to learn in and explore our underwater playgrounds. The Samui Archipelago is in the Gulf of Thailand, off the southern mainland coast in the province Surat Thani. The islands are sheltered from the open ocean; the waters are warm, clear, calm and not excessively deep. This makes for a good number of quality dive sites particularly if you are a novicelooking to dive for the first time. Not discounting advanced divers, however, Sail Rock and Chumpon Pinnacle are two of the best dive locations throughout the whole of the Gulf of Thailand. Due to Koh Samui’s sheltered location, the underwater visibility is consistently clear giving great opportunities for video footage and photography all year round. The only time of year that you might want to avoid diving is late October through December. This time of year is considered to be the wet monsoon season when the winds rise in the northeast and the rain showers and storms become more frequent. Above the surface, Samui and its surrounding islands have all the beauty you’d expect from a tropical paradise. However, below the surface is where some of its real treasures can be found. These waters are teeming with pelagic sea life, uniquely shaped and coloured coral reefs and amazing rock formations. Shoals of Barracuda, reef sharks, and other tropical fish swim around in abundance. If you are lucky you might even see a sea turtle or two. Aside from this beautiful sea garden and its wondrous variety of inhabitants, there is one special creature that only a handful of people will get to witness up close underwater, the largest fish in the sea, the whale shark. 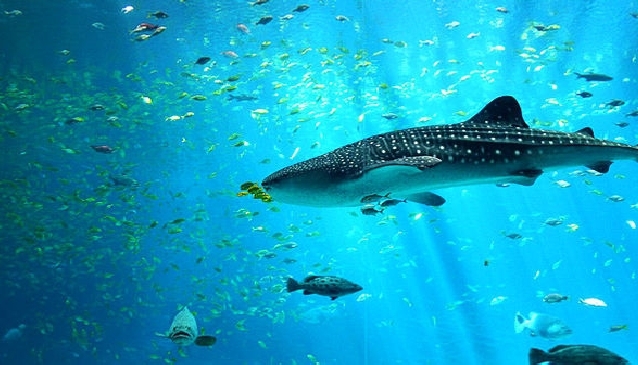 If you ever wondered where to find the whale shark, the Samui Archipelago is a great place to start looking. While the whale shark usually grows to 12 metres in length, some are said to have witnessed the creature at almost 20 metres. Diving with the whale shark is an experience that deserves superlatives such as, “breathtaking” and “awe-inspiring”. Being present while this beautiful, harmless and passive creature gracefully glides through the sea with its mouth wide open is truly a sight to behold. Unfortunately, illegal fishing by foreign fishing fleets has created a dramatic reduction of sightings off the Koh Samui waters . This is due to the high demand for Whale Shark fins in high-class restaurants around Asia. The sharks are killed in a brutal, inhumane manner for a meal that is only served for social status. If you do come across such items on a menu, please do not eat at the restaurant and take the opportunity to let it be known in social forums. The more people who are aware of this issue, the better chance the Whale Shark has of survival. The most common time of year to witness these great creatures passing through is between March and October. However, there have been sightings in December, January and February. There are many PADI certificated dive companies on Koh Samui and Koh Tao. Koh Tao is considered the “learn to dive Mecca” of Thailand, not only because of the ideal conditions but the cost is invariably cheaper than most other holiday resorts. If you are serious about learning to dive and want to earn your diving license it may be better to base yourself on Koh Tao. Dive companies have packages including accommodation options. This may also be a better option if your main goal is to witness the magnificent whale shark. Alternatively, day trips can be made from Koh Samui quite easily.